Below is information on each main 10:30 Sunday service (9:00 service during the summer), including a list of hymns, anthems and other service music; and a link to the service bulletin. Once a service is over, it is moved to the “Past Services” sidebar, and we add links to podcasts of the entire service and the sermon only, along with a text version of the sermon. New in 2018: Our 10:30 Sunday services and select special services are now live streamed online. You can watch a service live, or access the archived streaming video any time after. To watch live, click on the service you want in the “Upcoming Service” listing, then click on the embedded video at the service’s scheduled start time. To watch an archived video, click on the service you want in the “Past Services” sidebar, and then click on the embedded video. 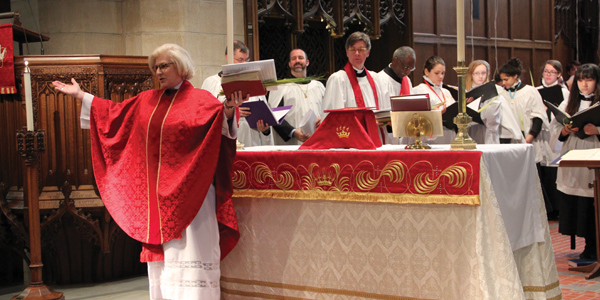 Choral Evensong at 5:00 p.m. sung by the Men and Boys of Trinity Church, New Haven.